Good News to all Overseas Filipino Workers who are currently waiting for the issuance of plastic license cards! According to Land Transporation Office (LTO) chief Edgar Galvante, OFWs are given priority in the issuance of plastic license cards. 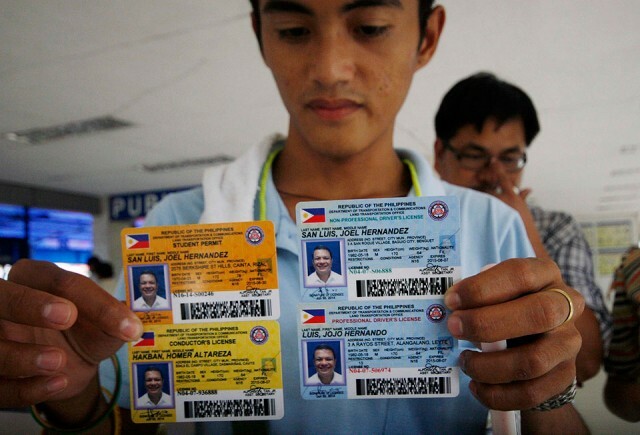 Galvante said, due to current shortage of license cards, the agency will prioritize OFW in the distribution. If you are an OFW and waiting, just submit your supporting documents in any LTO office near you. What you need to do is present your passport, employment contract, plane ticket or verified documents issued from Philippine Overseas Employment Administration (POEA) and Overseas Welfare Workers Administration (OWWA). “As of now, only overseas Filipino workers (OFWs) are given priority in the issuance of plastic license cards, subject to the submission of supporting documents such as passport, employment contract, plane ticket, and/or POEA or OWWA-issued/verified document,” said the LTO. 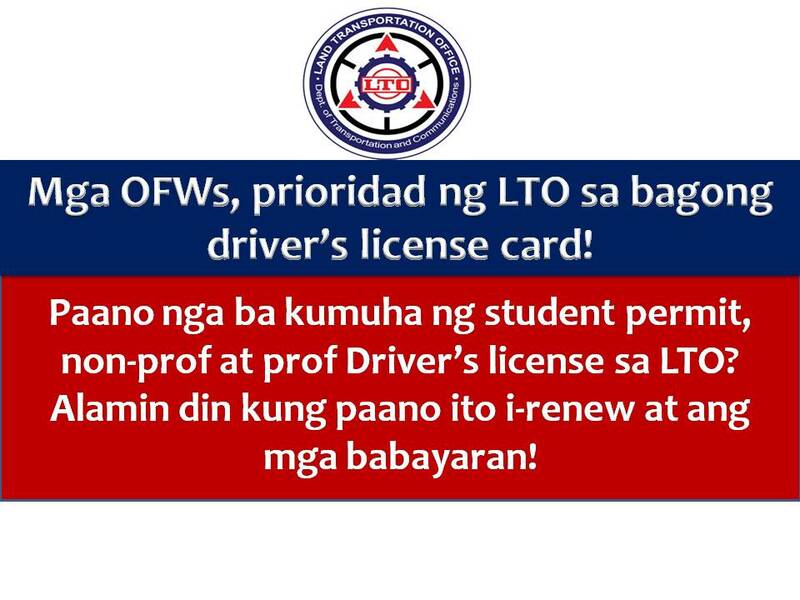 According to LTO official website www.lto.gov.ph, "OFW drivers are priotized in the release of the remaining supply of plastic cards. This is to prevent inconveniences and fruitless visits to our offices." 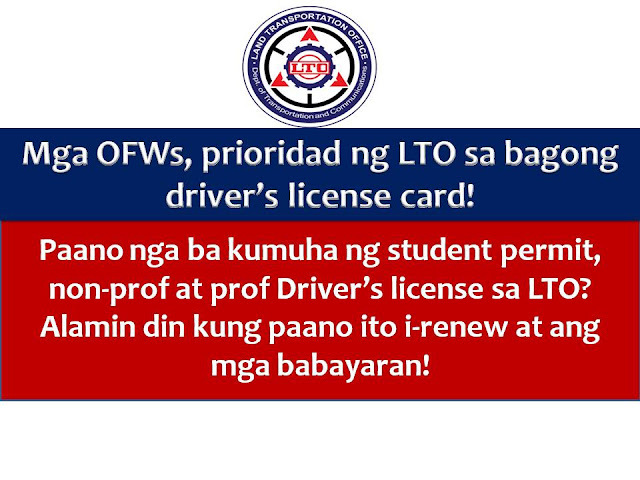 LTO's advisory could be bad news to those who are long waiting for their new driver's license card. The shortage of plastic cards started in 2013 when Commission of Audit (COA) disallowed payments to the previous cards supplier, Amalgamated Motors Philippines Inc., due to the lack of a proper contract. 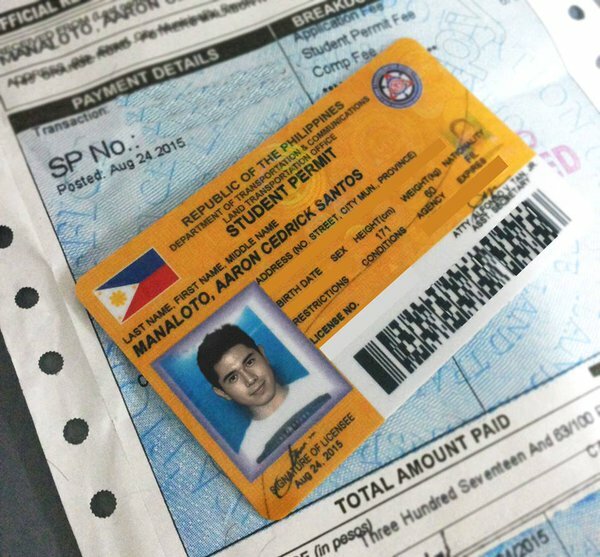 Starting last October 8, the LTO implements the 5-year validity of driver's licenses. HOW TO APPLY FOR A STUDENT PERMIT? A student permit is the prerequisite document when one applies for a driver’s license. Physically and mentally fit to operate a motor vehicle. Able to read and write in Filipino or English. A filled out application for driver’s license (ADL) [Download this form here]. *Applicants not yet 18 years old need a parent’s or guardian’s written consent with a photocopy of an ID card as proof of identity. If parent or guardian is not present, the written consent must be notarized. When your number is called, go to the evaluator counter and submit all the required documents to have it checked for completeness and authenticity. When your name is called, go to where your photo and signature will be taken. Go to the cashier to pay the fees and to obtain an official receipt (OR). Proceed to the releasing counter with the OR and claim the student driver’s permit. HOW TO APPLY FOR NON-PROFESSIONAL LICENSE? *Wearing of sando, sports shorts, and slippers during photo-taking and examinations will not be allowed. Duly accomplished application form for driver’s license (ADL) [Download this form here]. *Applicants who fail the Basic Driving Theory Test and/or the Practical Driving Test twice shall not be allowed to apply for the same within a period of 1 year. An applicant who fails either of the tests for the third time will not be allowed to apply for a period of 2 years. Go to the customer service counter to get your checklist of requirements and secure a driver’s license application form. [This form is available for download here. You can accomplish this form prior to transacting your business at the LTO.] Get a queue number. When your number is called, go to the evaluator counter and submit all the required documents and have it checked for completeness and authenticity. Go to the cashier to pay the application fee. Go to the Examination Room for the lecture and written exam. After passing the written exam, wait for your name to be called for the practical exam. After passing the practical exam, go to the cashier when your name is called for payment of necessary fees and obtain an official receipt (OR). Go to the releasing counter, wait for your name to be called and present the OR and claim the card type license. HOW TO APPLY FOR A PROFESSIONAL LICENSE? *Must not be afflicted with any contagious disease or epilepsy. In cases of heavy vehicles: A valid non-professional drivers license for at least 1 year prior to the application, or a valid professional drivers license to operate light vehicles for at least 6 months prior to the same. HOW TO RENEW A NON-PROFESSIONAL LICENSE? If the expiry date falls on a weekend, holiday or non-working day, the license shall be renewed on or before the last working day prior to the expiry date of such licenses as provided for in the third paragraph of Section 24 of Republic Act No. 4136, otherwise the same shall become delinquent and invalid, except when the license is surrendered to the Director of his deputies on or before the last working day prior to the expiry date of such license as specified, in order to avoid payment of the delinquency fees. Medical Certificates issued by any licensed and practicing physician and valid within fifteen (15) days from the date issued. 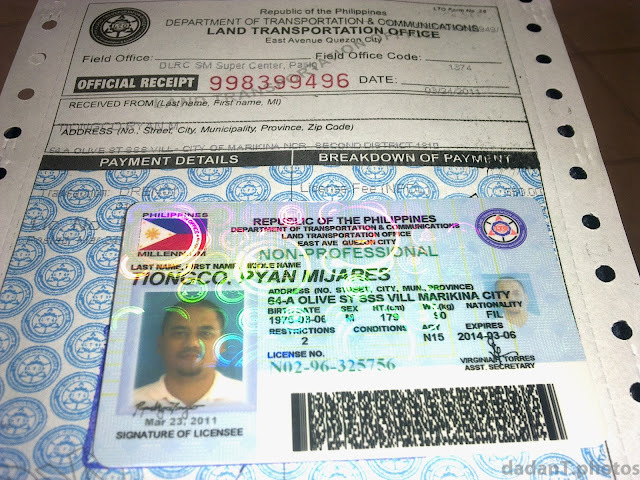 Tax Identification Number (TIN) (only for professional driver’s license applicants). Payment of required fees and charges. Personal appearance for photo-taking and biometric signature. Applicant will submit his/her expired driver’s license together with a Medical Certificate from any Accredited Physician to the LTO Evaluator. The Evaluator validates if the license is due for renewal and shows a screen shot of the present driver’s license data to the applicant. If the applicant affirms that the information is correct, the Evaluator shall return the expired license card to the applicant and shall then transmit the data for picture/signature taking. – If the applicant wishes to change any information in his/her data and additional restriction, said applicant shall be advised to go to the nearest LTO Licensing Center. – If the license of the applicant is on alarm, the evaluator will inform the applicant to settle his/her apprehension before his/her license can be renewed. Upon receiving the transmitted data from LTO evaluator, the concerned personnel shall take the picture and signature of the applicant. The applicant then proceeds to the last window. The Cashier will receive payment and release the new driver’s license card to the applicant. Applicants who submit fake medical certificates shall not be allowed to renew their license, and any license issued on the basis of a fake certificate shall be put on alarm and immediately recalled. The applicant shall also be disqualified from securing a driver’s/conductor’s license in the future in accordance with existing rules. HOW TO RENEW A PROFESSIONAL LICENSE? can accomplish this form prior to transacting your business at the LTO). Get a queue number and wait for your number to be called. 2. When your number is called, proceed to evaluator counter and submit all the required documents and have it chekced for completeness and authenticity. 3. Proceed to the Photo taking / Signature Area to have your picture and signature taken when your name is called. 4. Proceed to the Cashier when your name is called to pay for the necessary fees and obtain an Official Receipt.